This MonMount Plasma and LCD TV mount is great for conference rooms, schools, churches, and universities that need a mobile display. Just roll it in for your meeting or presentation and roll it out when you're done. 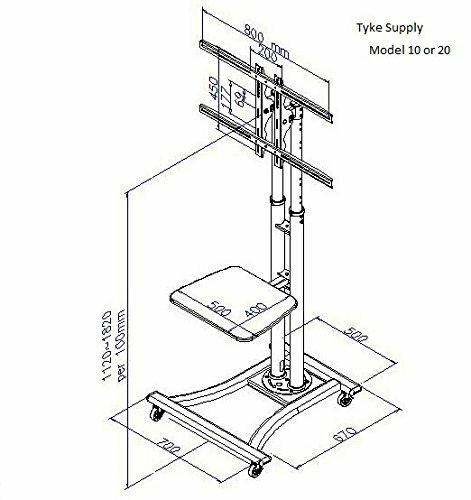 The heavy duty cart can support televisions between 27 and 60 inches with an additional shelf to mount a DVD player or other media device. With lockable caster and up to a 15 degree tilt, you won't find a better made cart. First of this is a fabulous product. That's all you really need to know, but for embellishment's sake i have rambled on with a few throughts. The product arived in two well packed boxes and was delivered very quickly, so these folks clearly know how to ship. Talking of ships, upon opening the boxes my first reaction was 'good grief! They've sent me the wrong parts - these are surely spares for the uss new jersey!" (i had bought the grey version), so well made is this product. Obviously being designed for the rigors of its commercial application it is supposed to be robust, but this is an object lesson in such design. Added to that each set of screws was bagged separately in a belt of pouches containing the right 'dosage' for each step of the assembly process (far eastern instruction manual writers please note) which makes for one of the best designed, presented and constructed products i have seen in years. Added to that is the fact that it is made in the usa. Ok, that done, the price is just right too, so all in all an american made product priced at the right level and built like the uss new jersey. Why can't the rest of our economy manage to do this?So i like it, right. Ummm, one small point. We bought it to be mobile around the upstairs - a sort of 'guest room tv' stand. Once assembled and ready to roll we found that the depth of the base is 1" more than the width of the standard domestic doorway (at least in our house, but ours is just like all the others in our street/town. Ok if you take the door off, it fits...), so the maufacturers may want to take note here. Oh, and how did we move it around? Simple. Take the tv off, roll it around backwards/forwards (it's narrower than it is wide) till you get it there then plunk the tv back on again (ours is a 32". Larger ones require a trip to the gym). We don't move it much so it's not a problem for us. All in all worth every one of the five stars it gets. Well done! I looked a a number of these stands, and this one was the least expensive. I was concerned about that, but took the plunge anyway and am very happy i did!This thing is solid as a rock, has good adjustment capability, and came with all the tools and parts needed to mount a 42" tv. We use this for a portable voip/web conferencing unit, and being able to wheel it around where needed is great. I was concerned it may not fit through a door, but it does so just fine and always feels like the unit is on steady footing. I added a power strip with a 14 ft. Cord that i mounted to the back and hide all cords in the hollow neck tube for a very professional looking installation. I had no issues putting it together at all, you just have to understand they send way more pieces of hardware than you need in order to accommodate many sizes and types of tv installations. Lay it out, look it all over and put it together -- no problem!Liked it so much i ordered another one! I am very pleased with this mobile tv cart! It is sturdy and heavy enough to be moved room to room by 1 person with ease. I have a 55" flat screen on it. It was simple to put together. 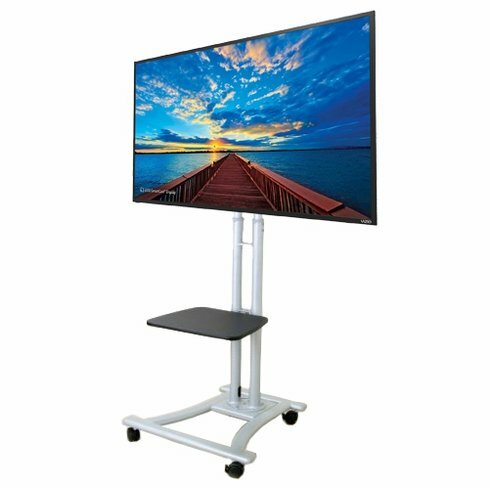 Whenever i told someone i was going to buy a cart for the large flat screen - everyone i work with doubted that an effective product existed. Now, they love it too! I am a believer. 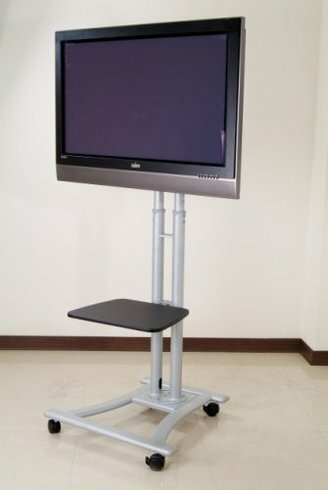 I bought three of these carts to use at my church for our 3 flat panel tvs. We use the carts weekly and have found them to be very sturdy and easy to move around. Wow! After pricing several of these products from various places, i was nervous about this one because the price was half what others were quoting. However, i took the chance and am glad i did! This is a great product. Easy to assemble, shipped quickly, looks great, and gets the job done. Don't be fooled into buying a higher price item -- this one is perfect! This thing is heavy, but it can handle serious av equipment, is well designed and stable, and comes together pretty quick. Like the fact that you can get the screen up pretty high so that it can be seen even in crowds. Very good value for money. Only wish is that they make it out of a lighter metal, but that would impact the cost. After a lot of searching for good tv stands, we ended up with a couple of these and couldn't be happier with them. They telescope nicely so you can set the height you want, and the wheels are good too, not the cheap casters. If you are looking for a well built tv stand for a very reasonable price i would highly recommend these. I've used two other stands and this one is the least expensive of the three and it stands up just as well as the other two. It goes together really easy and seems very sturdy. This product works great for me! 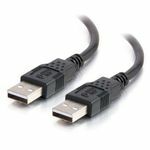 I'm a student and i move a lot, i don't want to spend 100$ on something at would break if not handled carefully. This is solid! And can be taken apart when moving. Instruction is a little confusing. But its an easy instal, you don't really need the instruction. It seems that those two poles have a cable organizing function. But it's not very helpful for me. I have cable, ps3 and a computer connect to my tv. There are a lot of wires. They just won't fit in there.This is a great idea for any college student. The product was as described on outletpc. Very good quality and easy set up. Would buy again if i had the need for another one. how wide is the shelve? Does this product come with a mounting bracket? This product mounts to the riser on the cart, the riser pole has a bracket that is attached to it. This item also includes the mounting hardware for the TV as well. I need to know if the product comes with a mounting bracket or if it needs to be purchased separately? Thanks.